Technical comment can be thoroughly appreciated only by the members of his craft, but the human interest aroused by the realization of his struggle against well-nigh overwhelming difficulties will be sensed by everyone who shares in the hardships incident to any phase of the world's work. He was an artist by primary instinct, but was opposed even by the wishes of his mother, and at the start of his career he had this greatest hindrance to overcome. A Slav by ancestry, born in Ivancia, in Moravia, hence a Bohemian by birth, his temperament, a mixture of passion and melancholy, with a strong undercurrent of poetical feeling, surely did not qualify him for the life of a priest, which was his mother's dearest wish. He was born in 1860, and at the age of ten his mother sent him to Bruenn, where he became a choir boy in the Metropolitan Cathedral. At sixteen he was still pursu­ing his studies for the priesthood at the College of Bruenn, where he concentrated all his efforts in the occasional drawing lessons, to the sad detriment of the rest of his work. Although he was in dire circum­stances, he shared his room with a student even poorer than himself, and frequently their only fare was a large round loaf of black bread. 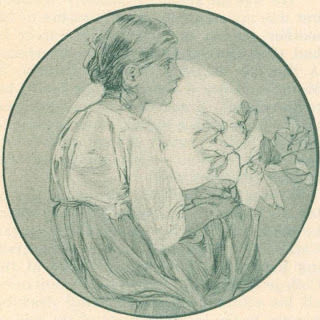 Mucha being the draftsman, marked off with chalk the exact share of each for days in advance, and in lieu of butter, they spread it with thick pork grease, which was sent in from the peas­ant lad's mountain home. 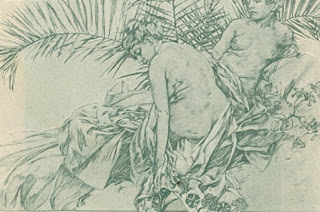 When the excellence of his work became apparent, Zeleny, his master in drawing, sent some of his sketches to the Prague Academy of Fine Arts. Here the young artist met with a sad rebuff, for the un­sympathetic head of the academy advised him to drop art and become a government clerk. Rather in doubt, but still ambi­tious, he gave up all idea of intimate asso­ciation with the church and went to Vienna, where he spent some months assisting on mural paintings for a new the­ater. After that he went to Nikolsburg, a small Moravian village. To maintain the social prestige he deemed necessary to success, he stopped at "The Lion," the leading inn. He was both witty and musical and consequently was in demand despite the fact that his wardrobe was "artistically" shabby. At one time his only pair of trousers was in such a perilous condition that his sole ex­pedient was to wear his top coat through­out the evening, on the plea of suffering from chills. After several public appearances in this rather embarrassing condi­tion, he was surprised one day to receive a visit from the tailor of the place who measured him for a pair of trousers, and politely but firmly declined any sugges­tion of payment. Mucha later appeared in his new raiment and was much compli­mented on the color, cut, etc. But it was not until twenty years later, when success had come, that he chanced to learn from a letter of one of the old townsfolk that the trousers had been a spontaneous gift from the ladies of Nikolsburg. The wife of the innkeeper became inter­ested in the youthful artist and through her influence he was introduced to the Count Khuen Emmanof, the great man of the province, who was renovating and re­storing his ancestral halls. This nobleman was delighted to find so skillful a decorator available. The artist executed for his walls no less than thirty compositions devoted to games and sports of all ages and nation­alities. 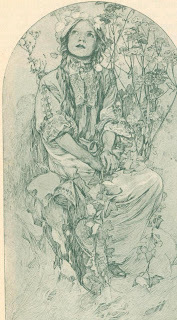 The due reward for his labor was a modest pension, which enabled Mucha to pursue his studies in Paris. There fol­lowed a number of years of academic train­ing to which is due, in a measure, his present marvelous facility in drawing the human figure. The Count's interest was not permanent and the latter part of this period of study was marked by privation such as only an art student of Paris can fully comprehend. 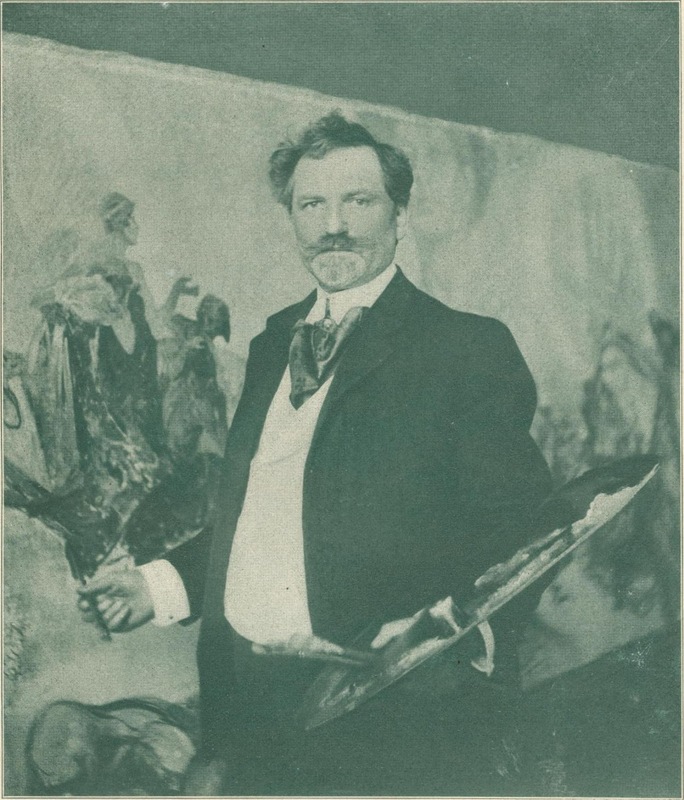 In 1894, when he was thirty-four years old, a time when the lifework of most men is fully under way, he chanced one day to be in the office of a lithographing establishment when Monsieur Brunhoff, the di­rector, was called to the telephone by the manager of the Renaissance Theater to state whether he could furnish a poster immediately for Sarah Bernhardt's "Gesmonda." 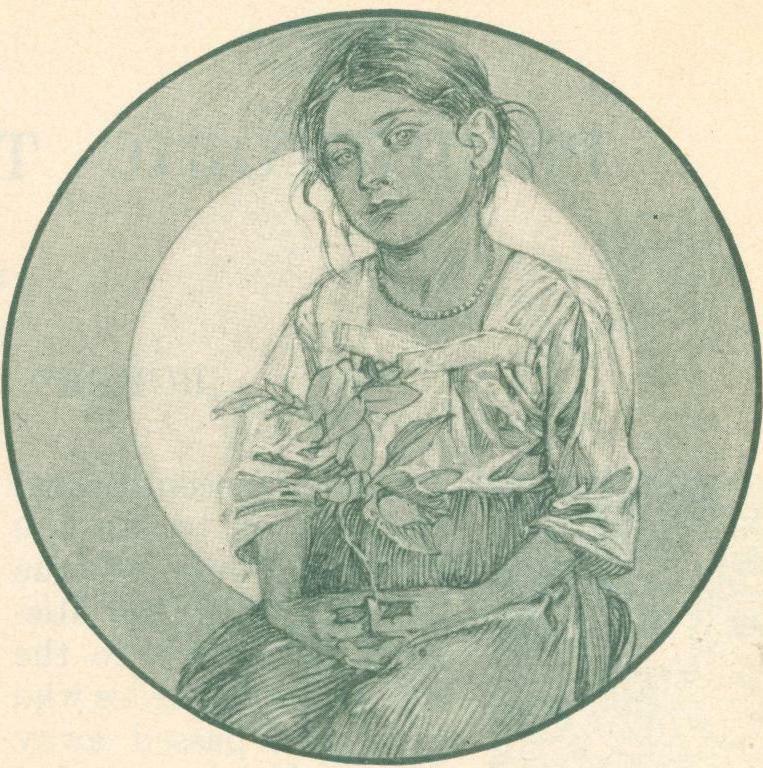 Mucha, the nearest available artist, was given the commission. The work was done in such a hurry that it was not entirely completed in the mechanical handling of the poster itself, but the great tragedienne was so pleased with the result and the character of its conception, that she resolved to give all her future work to the artist, and fame and success were immediately his. Once on the great high road, his pro­duction became truly marvelous. 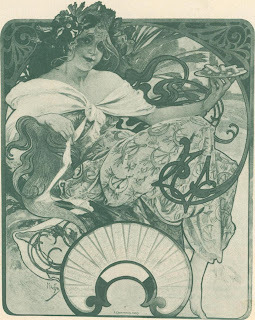 His numerous posters for Madame Bernhardt served to make him highly popular with the French public, while the immense amount of work done in other directions laid the general results of his efforts open to the criticism that they suffer from over­production and possible repetition. At this time he was doing serious composi­tions in numbers. In those in which he was free to follow his fancy, we find purely legendary creations, the embodi­ment of love, tenderness, pleasure, and joy, handled with a delicacy remarkable for its freshness of conception. His own world is a place of subtle beauty, where unkind passions find no footing. As a designer, a worker in metals, tex­tiles and clay, he stands as the originator of the much-abused term, "l'art nouveau," that bromidic excuse which is given to justify any creation typified by a weird informality of design. Yet the queer-shaped vases and other wholly inartistic craftsmen's products which have been thus classified must not be confounded with the beautiful design which is peculiarly Mucha 's own. "Harmony of line," the artists call it, but we ourselves can only feel that it pleases our eyes and gratifies the desire for rhythm which is instinctive with us. A very close student of nature, he has adapted and conventionalized plant forms in a masterly manner. Through it all he carries a definite scheme of proportion, and a system of composition which he has himself developed. Its basic principle is the division of lines and surfaces with the ratio of two to three, a technical considera­tion which is of interest only as it be­comes apparent on examining his work, when it will be found that he rarely de­parts from it. By his work as a designer and as the creator of beautiful posters he has won for himself the undisputed title of absolute master in decorative design. In this way he has carried the possibilities of commer­cial art to the limit, and thus he is the acknowledged ideal of all the ambitious —Men doing work of this nature. His more serious work, that which will be most likely to live for future genera­tions, is found in the multitude of decorations which he has painted for buildings in many countries. So far away as Jerusa­lem he has decorated the Church of the Assumption, the beautiful panels being on exhibition in this country before they were permanently hung. Countless walls nearer home show the results of his unceasing labor. Throughout their composition and general conception they bespeak unmistakably the master mind which created them. Yet there are those who would have it that his fund of ingenuity and imagina­tion has become exhausted and his work monotonous. At the present day he is in this country, deserted to an extent by his French admirers, whose fickle interest is now occu­pied with work of a newer and stronger, though less purely beautiful type. He makes New York his residence but re­cently has spent a month in Chicago, lec­turing and teaching at the Art Institute. During that time he has worked on the beginning of a series of decorations for a theater now being erected in New York. A preliminary painting for one of the pan­els, completed during his stay, is repro­duced herewith. It was while at work at his canvas that he turned an instant to look at the camera. The photograph shows the immense scale of the work, yet this "composition" is but half the size of the finished panel which is to be thirty feet long and about ten high. There are to be six panels in all. The subject of this first one is "Harmony," typified in the monu­mental figure which can be seen in the background. 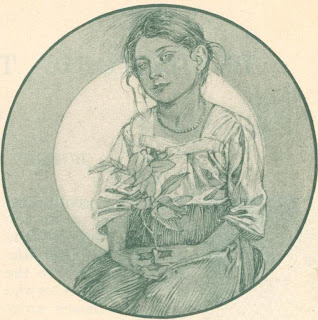 With her hands, "Day" and "Night," she is bringing amicably together all the opposing forces of the world; the rich and poor, the strong and the weak, life and death, all are being irre­sistibly drawn, in a pictorial manner dis­tinctly characteristic. The play of color through the canvas is very interesting, ranging from the deep mystic purples of night to the intense warm glow of day­light. Ruskin has said that a painter's art always expresses himself, and in Mucha teacher, though his students find him a jolly comrade rather than an autocratic master. Possessed of a wealth of anecdote gathered from his varied experience, he is a most interesting conversationalist and his limited knowledge of English serves only to increase the fascination of his nar­rative. 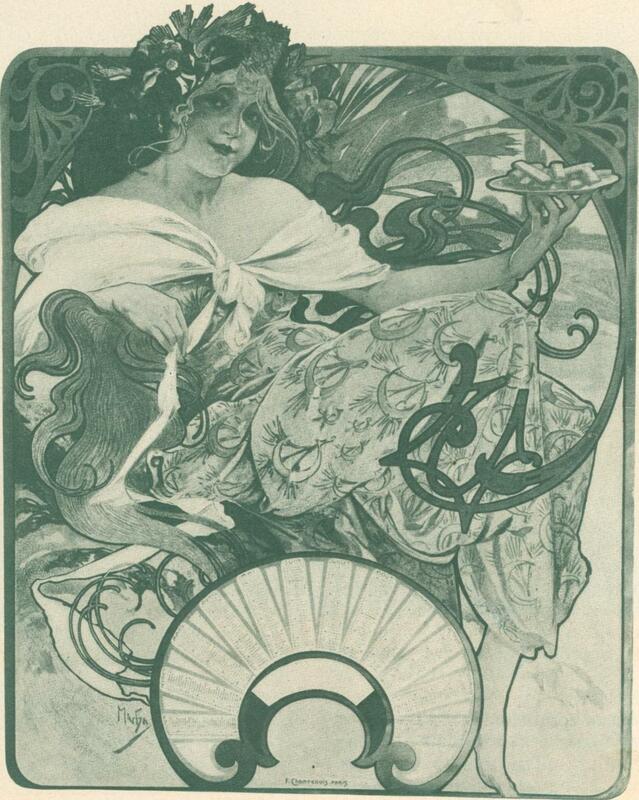 "Mucha has idealized the poster, and in his hand it has become a thing of real and we find the converse true as well. In his personality he is all that his work would indicate. Despite the many honors which have been heaped upon him, he is delight­fully democratic. A store of tact and patience makes him a particularly good penetrating beauty. Instead of crudeness of form, glaring incongruities, and weird exaggerations, he gives us poetry of line and delicate, fantastic design; instead of strong colors, subdued tones that are at once a delight and a repose." 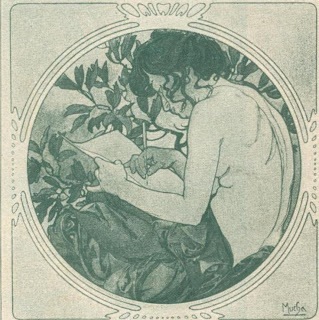 From the Cosmopolitan Magazine, 1908.